I personally think literature is a hard subject to teach. First off it was hard to find a solid curriculum that my children would love. I did some research - but I wasn't one hundred percent thrilled with what I found. Either the stories were not interesting or the work was hard or over their grade level. There was no happy medium. 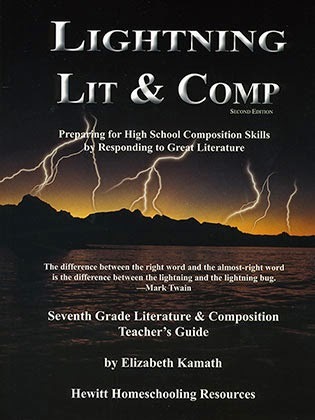 Then I was picked to review Lightning Literature and Composition: Grade 7 by Hewitt Homeschooling. This has changed everything! It is a solid course that is teacher friendly and has great selections for reading. The books needed to complete this course (which can be purchased separately or in the above complete pack). 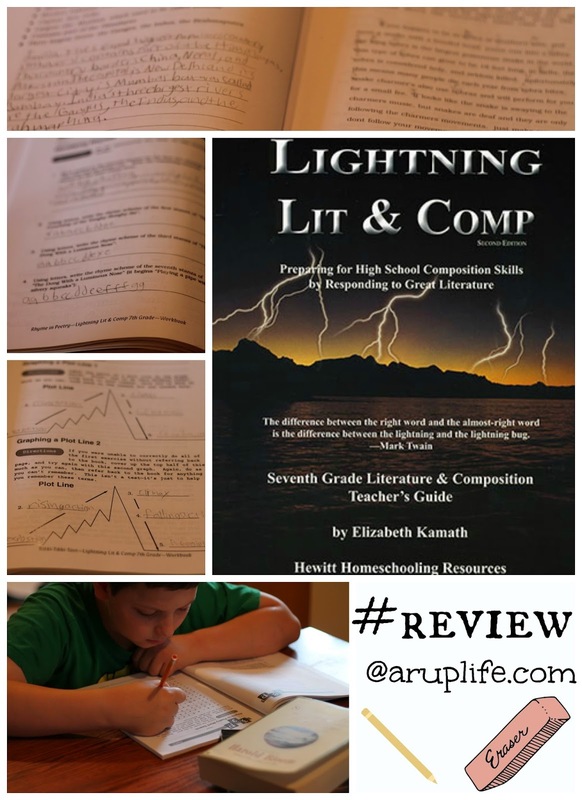 This curriculum is recommended for grades 7th or 8th - we used it for our 7th grader. It is summer time here and we are on a short course load. This basically means that my middle son only had to work on a few math lessons and this course. I chose to start in Semester 1 which covers 18 weeks of work. We started at the beginning with week 1. Then continued on that lesson which is chapter 1 in the student's guide. The first story came out of Stories and Poems for Extremely Intelligent Children of All Ages. It was "Rikki-Tikki-Tavi". I didn't remember that story from when I was little so I decided to read it aloud to my son. One morning before the brothers woke up he crawled into my bed and I read the short story to him. Honestly it was a great story - and I'm so glad I took the time to read it to him. Then over the next few weeks he completed the work book pages according the schedule. Some of these were a challenge but with a little encouragement and help from Mom, Xan completed the pages. After that chapter the next chapter (2) would have been Tom Sawyer. However, the next few weeks were just scheduled reading and no workbook pages so I talked to my son and asked him if he minded if we saved that chapter for the fall and skipped to the next chapter which would be week 12 in the schedule. This way I could get a better feel for the course and he would have more work than just reading. So we skipped to week 12 which was all about poetry. Again I chose to read aloud to him. We had a hoot with the poems. I really like the choices for this book! They were fun to read and had great little stories in them. We added the rhyme scheme to the poem to better grasp the concept. We were able to cover haiku, couplets, limericks and rhyme scheme. While he struggled a little it was nice to work with him each step of the way. The way the workbook schedule is broken down the students have several days to work so it wasn't taxing on either of us. This poem chapter was a great little course unto itself. I believe he learned so much in these short weeks. I loved the Teacher's Guide. It felt like the author Elizabeth Kamath was right in the room with me giving encouraging words when needed. For example the first lesson included learning about story openers. My son didn't quite get which ones were better when doing the work independently. Kamath gave the tip to go back over and talk about openers and have the child see which ones appeal to him. This was a tremendous help. I really do like when the teacher's book isn't just answers but offers insights and explanations. That guidance really helps if you are not as versed in teaching literature - which is exactly what I needed. The student's books are broken up into two thinner books - the workbook and the Student's Guide. I don't mind it being two separate books but I would have preferred a bigger book that was all in one. I know my son tends to lose books (even in our house!) so in the back of my mind I'm thinking we will have to search one day for one of the books. I also felt a bit of confusion going back and forth between the two. Mind you I still think this course was awesome and it was not a deal breaker for me at all. I feel like overall this was very on point for seventh grade. There was harder course work - like writing several haiku but I feel that is exactly the work a 7th grader should be able to do. We are going to continue this course in September when we start back to school. I'm excited to see the rest of the reading choices and how much my son enjoys them. I have a feeling we will continue reading aloud with most of the smaller stories/poems. For the longer books like Tom Sawyer I think I will read along with him so we can discuss the chapters together. Be sure to stop by Hewitt Homeschooling's Facebook page for additional information. Be sure to click on the banner below to see what other homeschoolers thought of this course. We all reviewed different levels so if your looking for a different grade this is a great place to start!